Jasper Stuyven has won the final stage of the BinckBank Tour. The Trek-Segafredo rider finished off a late solo attack in Geraardsbergen. Tom Dumoulin took third to ensure his overall win in the event. 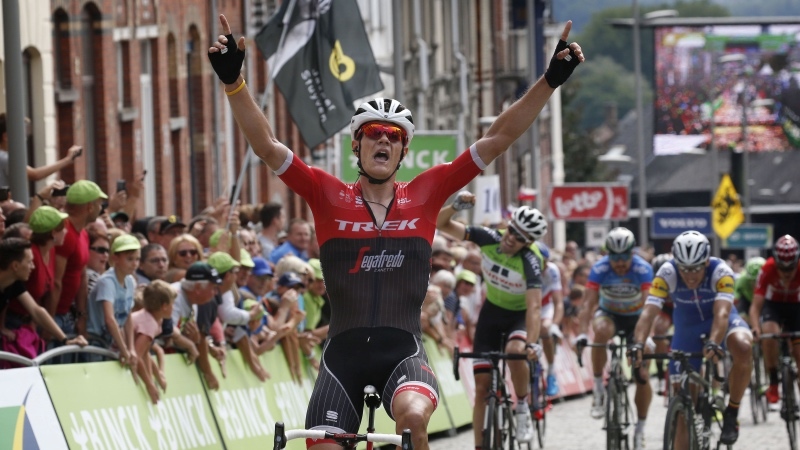 The final stage from Essen to Geraardsbergen was coloured by a breakaway with seven riders. Just like on Saturday Tony Martin (Katusha) went on the offensive, along with Elia Viviani (Team Sky), Robert Jay Thomson (Dimension Data), Grega Bole (Bahrain Merida), Elmar Reinders (Roompot - Nederlandse Loterij), Kenny Dehaes (Wanty-Groupe Gobert) and Tim Merlier (Crelan-Willems Veranda's). The duo Jonas Rickaert and Preben Van Hecke (Sport Vlaanderen-Baloise) joined later on. On the first passage on the famed Muur van Geraardsbergen, Wout Van Aert and Danny Van Poppel went to the front, where only Martin and Viviani managed to stay ahead. The race really kicked off on the second passage when Peter Sagan made his move. The world champion's attack on the Kapelmuur was impressive but the Slovak didn't get enough support to carry on to the finish. Soon after the favourites came together again. Following a brief moment of peace, several riders tried their luck alone. However, attempts by Jos Van Emden, Greg Van Avermaet and Sagan were quickly neutralised. The attack of Jasper Stuyven, with three kilometres to go, was more successful. Just like in Sittard Sagan decided to stop chasing the Belgian all alone and Stuvyen could benefit from the tactical mind games behind him. At the finish Stuvyen just managed to hang on, taking the win a second ahead of Philippe Gilbert and Tom Dumoulin, who did enough to secure his overall win of the BinckBank Tour. Sagan was fourth. In the Binck general classification Dumoulin is joined on the podium by Tim Wellens and Stuyven. Sagan took home the Lotto points standings, while Piet Allegaert conquered the Primus Combativity ranking.